By John J. Raspanti, Doghouse Boxing: Peter Manfredo Jr. will have many boxing fans pulling for him when he challenges WBC middleweight titleholder Julio Cesar Chavez Jr. November 19 at the Reliant Arena in Houston, Texas. Manfredo’s honesty is refreshing in a sport filled with hyperbole and false modesty. The working-man from Providence pulls no punches and tells it like it is, even when discussing his own chances of winning. The 30-year-old Manfredo has won 37 of his 43 fights with 20 of those wins coming via knockout. Chavez,25, is undefeated with 30 of those wins coming inside the distance. Last June he claimed a portion of the 160-pound crown by winning a hotly debated majority decision over Sebastian Zbik in Los Angeles. Manfredo’s been training hard for the past five weeks and feels he’s right on track. The likeable contender has been watching tapes of previous Chavez fights. “He goes to the body well and has a great chin.” he said. Chavez Jr’s defense sometimes disappears during fights. Manfredo has noticed the lapses. In 2007, a visibly nervous Manfredo challenged super middleweight champion Joe Calzaghe in Cardiff, Wales. Calzaghe outworked Manfredo in rounds one and two. Manfredo found himself against the ropes in round three. Calzaghe’s punches were coming in bunches,some landing others missing. Manfredo blocked most of the punches but wasn’t returning fire. The referee saw a beaten fighter and stopped the fight with Manfredo languishing on the ropes. Manfredo addresses the Calzaghe loss swiftly and honestly. Dropping back to the middleweight division was a stroke of genius by Manfredo and his team. He’s beaten Matt Vanda, Angel Hernandez, Jhon Berrio, and Daniel Edouard in succession. His jab has looked razor sharp in those bouts. In a career filled with more up’s and down’s than an out of control elevator, Manfredo’s perspective is pragmatic and real. “I’ve been very satisfied with my boxing career. I was an unknown kid from Providence, RI. I who was not a great amateur boxer." "I’ve accomplished more than expected as a professional. I built my record up to 21-0 and captured the NABO title. I caught a break on the reality show “The Contender." 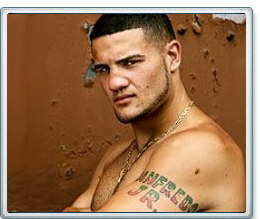 A loss to Chavez will send Manfredo into retirement. "If I lose, I hang it up and concentrate on being a great father to my kids,” he says, with no hint of bitterness. “If I win Sergio Martinez pays off my house,” he replied. This real life “Rocky” will have his work cut out on November 19. Manfredo has the kind of boxing skills that can give Chavez fits. Texas is Chavez country so winning a decision looks like a long shot. Still, he's got a chance, and a chance is sometimes good enough.